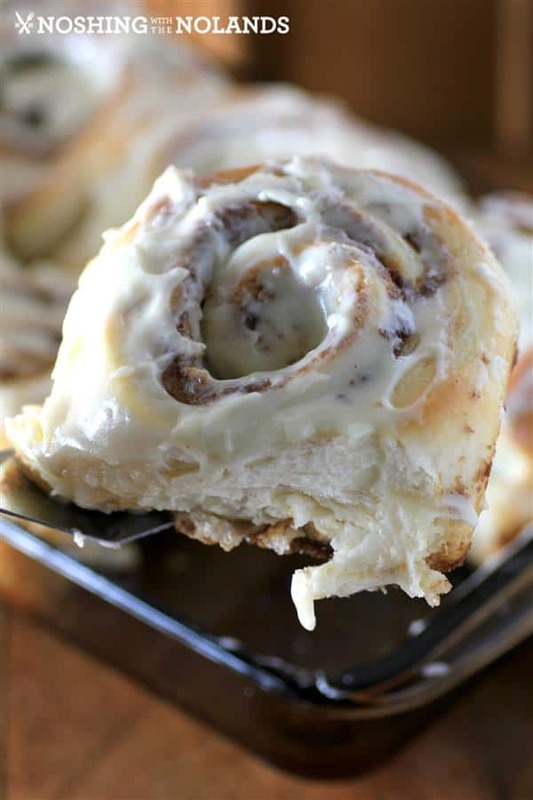 There’s nothing like the smell of cinnamon rolls from the oven – have you ever stopped dead in your tracks in the mall when you walk past that delicious smell when Cinnabon cinnamon rolls are baking or they’re straight out of the oven? 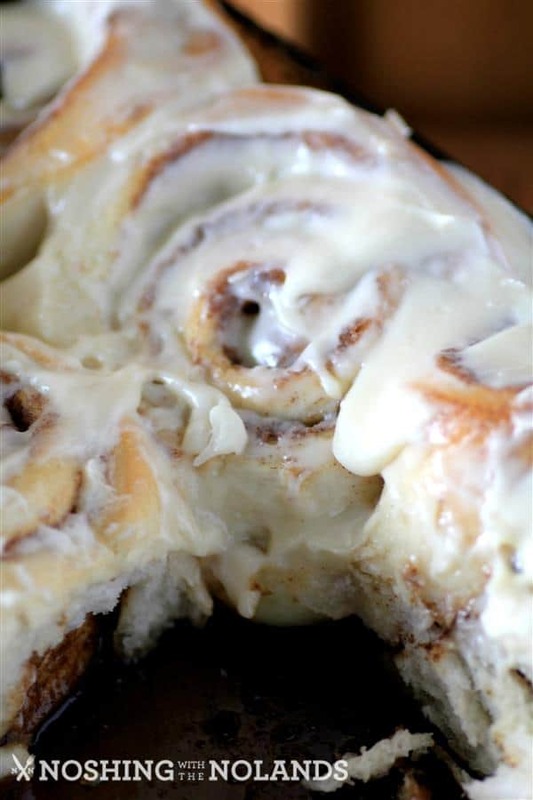 Watching the icing melt on the still warm cinnamon rolls is one of life’s greatest pleasures. But, the cinnamon buns from the mall can be big and they cost a pretty penny. 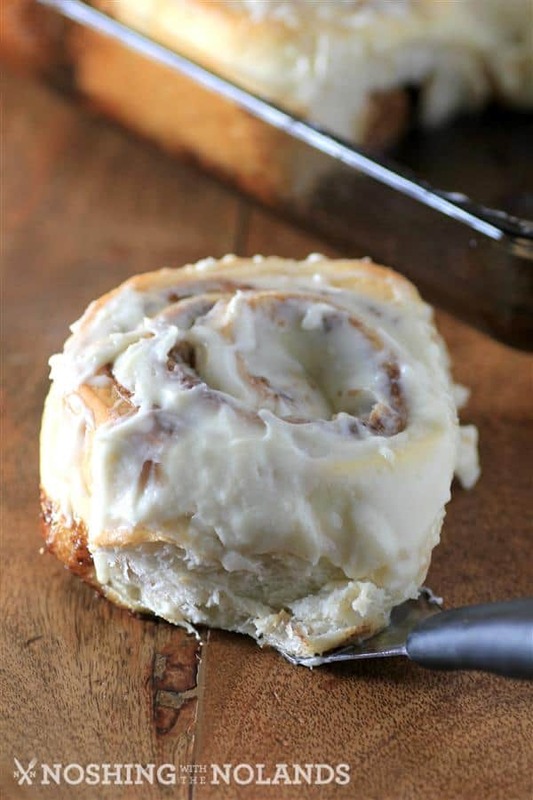 Why not try this recipe for homemade cinnamon rolls that taste just like Cinnabon Cinnamon Rolls but are made from scratch with quality ingredients and come out of your oven perfectly golden brown ready to frost? 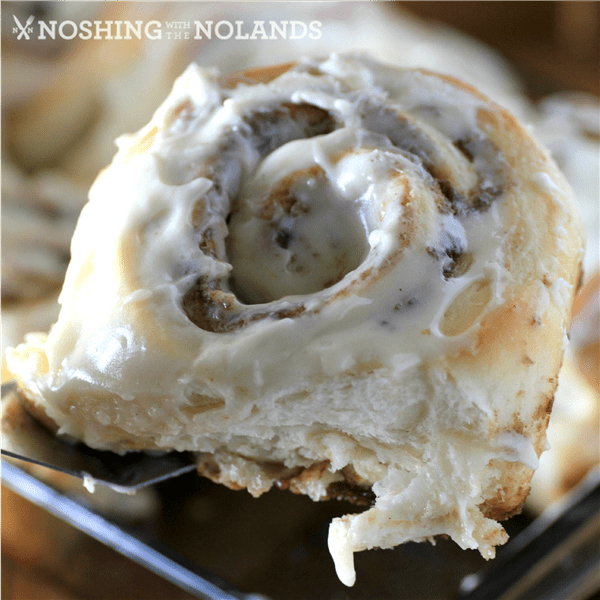 Once you see how easy these are to make and how amazing they taste, you won’t ever be tempted by the Pillsbury make at home cinnamon buns again! I can’t promise that the smell in the food court won’t be tempting, but knowing you can make these at home is a good reason not to buy any! 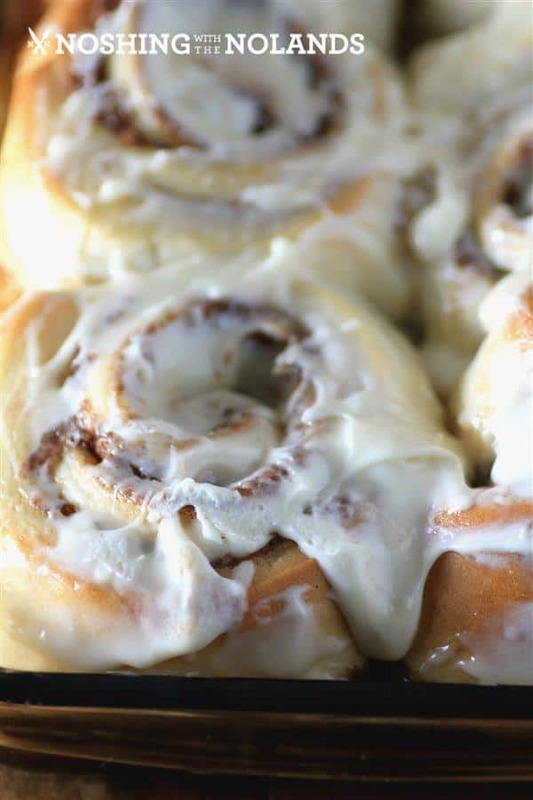 Everything you dreamed of in a perfect cinnamon roll and made fresh at home. There is nothing like the smell of fresh bread baking!! We have made cinnamon rolls before but never quite this big and beautiful. These were outstanding and really not that difficult to make considering the end result is this deliciousness! If you want to make mini rolls (and get more of them in a batch) you can do that too, but these big beautiful rolls don’t last long in our house! We made these when we were having Ken’s cousin over for brunch. They were thoroughly enjoyed by all. They make a great treat from morning until night, breakfast right through to dessert! The recipe makes the perfect amount of 12 scrumptious rolls. Enough to share at any meal and some leftover for gifts too! 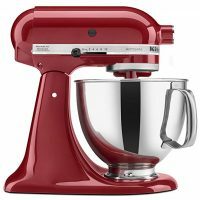 While I use a stand mixer for this, you can make it by kneading it by hand if you don’t have a stand mixer. Mix it in a bowl with a spoon for as long as you can. Then knead with your hands until all the flour is incorporated into the dough. The dough should be tacky to the touch when it’s ready. The advantage of kneading by hand is that you’ll be able to tell when it’s fully mixed by how it feels in your hands. You want to use warm water – it should be a few degrees above room temperature but not hot – and mix it with ½ cup of sugar. The warm water helps the sugar dissolve more quickly than room temperature or cold water. Sprinkle the active dry yeast over the water and sugar mixture – it needs to go on top and work down – if you put it in first it may need to be stirred to fully activate. Make sure you have a light dusting of flour on your work surface whenever you’re rolling out or kneading the dough. When dough is worked it gets stickier so the flour stops it from sticking to the surface you’re using. I recommend plastic cutting boards (that are only used for dough) or a silicone mat to knead dough. You can use your (clean!) countertop if you want. You want to put your dough in a warm spot in your kitchen but not in direct sunlight or over a heating vent – that can make it too warm. Don’t attach the plastic wrap to the bowl – the dough is going to expand so it needs room to do so. Use a light kitchen towel – if it’s too heavy it can make it harder for the dough to rise. Be careful not to let it rise too much – it should be roughly doubled in size. Finally, make sure to do the icing in stages – half about 5 minutes after the buns come out of the oven and then the other half when they’re cool. This is because the first half melts down into the buns (oh so good!) so you want the second half to stay on the top! 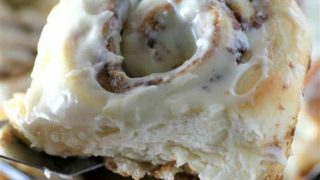 Copycat Cinnabon Cinnamon Rolls are everything you dreamed of in a perfect cinnamon roll and made fresh at home. In a bowl of a standup mixer, fitted with a dough hook pour water and sugar in, sprinkle yeast over top and stir. Let stand for 5-10 min. until the mixture becomes foamy. When the dough is ready turn it onto a lightly floured work surface. 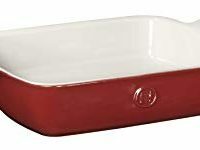 Knead the dough a few times and then roll it out into an 18"x24" wide rectangle. Spread on the 1/2 cup softened butter. Leave a 1" border around the edge. Sprinkle the dough with the brown sugar mixture and press in with a rolling pin. Now take the top long end and roll towards yourself. Run a bead of water on the last 1" of dough to seal. Cut the dough in half and then each half in halves, you will now have 4 pieces. Cut each of the four pieces into thirds. You will have 12 rolls now. Grease two 8x11" pans and 6 place rolls swirl side up into each pan. Place end pieces upside down. Again, loosely cover with plastic wrap and drape with a kitchen towel. Let stand in a warm spot in the kitchen and let rise until doubled aobut 60-90 min. When the rolls are baked let cool for 5 min. then spread on 1/2 the icing. Let cool further and spread on the additional icing. Warm out of the oven….these are delicious!!! Ohhhh my gosh. I’m in heaven. Want one of these so badly!! Can you prepare these the day before so that you can bake them first thing in the morning? And can you freeze half of the rolls for the future? I would say you can make the dough the day before and let rise and then refrigerate. I would do the second rise in the morning. They would freeze well after baking if they aren’t iced. Then reheated and iced before serving. I love the freezer for so many things so I think they would be great done that way. I always package four to a bag and freeze my cinnamon rolls with frosting on them, frosting is no problem when freezing. Can you ship a few too me! These look like the best! Is the dough recipe adaptable to a bread machine? I would say yes Thomas, but I couldn’t give you specifics. All bread machines differ and call for an adjustment of ingredients. I am jealous, man are they good! OMG! Those pics are making my mouth water. Those are some serious cinnamon rolls! Hello. Are these supposed to have a crunchy filling or gooey? More gooey than crunchy I would say! Ok thank you! I believe I over baked them. 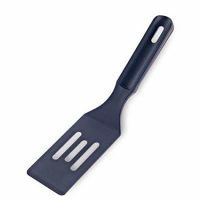 I don’t have a 8×11 pan can I sub it with another size? You could use a 9×13″ but there may be some gaps and not turn out as well. Good Luck, ask me if you need anymore help!! Does it matter what kind of flour is used? I usually have bread flour but I’m out and I’m wondering if I can substitute all purpose flour? Or would that totally ruin it? If it just says flour in a recipe it would almost always mean AP (all purpose) white flour and that is what was used. I just made these and they were awesome! Thanks for the recipe. So glad to hear Holly, we sure love them also!! Can I use a 2% milk instead of homo? I think that would be fine Julia. What is homogenized milk and how to make it? Please reply. Thank you. Can you make rolls with this dough? Good question, we haven’t made them but I don’t see why not! I would say you could give that a try and see if you like it for sure! I made these this weekend for my family and all I can say is WoW!!! It was a long process but totally worth It! They turned out big, and beautiful, and taste exactly like Cinnabon Cinnamon Rolls! So so happy to hear!! Thanks April!! I made these. They look amazing, icing was so silky, texture seemed great however they tasted very blah! I checked recipe and went over everything I did can’t figure out why. I did notice no salt in recipe? Next time you can add salt if you like for sure! Approximately how long does it take from start to finish? I noticed at the top of the recipe, it says bake time is 20 minutes, total time is 20 minutes. 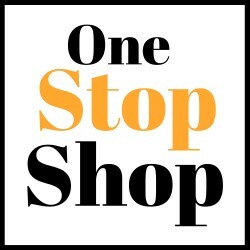 How long is prep time? You need to do 2 risings of 60-90 min. each, plus the time to make the dough and then the 20 min. bake time and time to ice also. It is a recipe that you will want to give yourself lots of time to do. I’ve never seen this before. Whats the purpose of corn starch in the filling?